On arrival at Krabi airport, welcome and transfer to check in hotel. Relax at your leisure and overnight at hotel in Krabi. 08.30 Pick up at hotel and transfet to pier for speedboat heading to Krabi sea. Visit to Phra Nang Cave and East Railay Bay. Second stop is Tup Island, an exotic tropical island, during low tide you can walk along the sandy causeway joining the neighboring island which we call “Talaywak” one of Unseen in Thailand. Next stop is the famous Chicken Island, you may take a photo shot for your memorable. 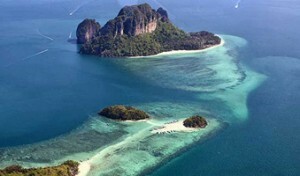 Visit to Koh See with excellent snorkeling opportunities rich in coral life. Last stop is Poda Island a stunning jewel in the Andaman Sea with both lowland and majestic rock cliffs. Lunch is served at a beautiful beach (picnic lunch). Evening return to hotel. Relax and overnight at hotel. Breakfast at the hotel. Today program for Koh Hang & Talay nai tour. 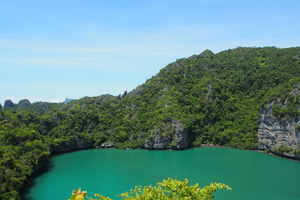 Koh Hong is the island of rooms with the perfect escpae destination. A wonderful island location renowed for its breathtaking beausty, shallow coral reefs and fine sandy beaches. 07.50-08.30 Pick up at hotel and transfet to pier for speedboat heading to Koh Hong archipelago. Take time about 20 minutes by speed boat. 10.30 Second stop is Pakbia Island, two undeveloped islands, like nature’s secret with white, sandy beached ans scenic views. 11.00 3rd next stop is the Lading Island (Paradise Island) the natural, quiet away from crowds. 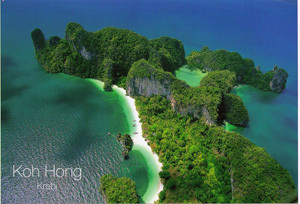 12.00 4th Visit to Koh Hong Island Bay, the main beach and bay ideal place to relax with swimming, snorkeling, exploreing. Picnic lunch in the most beautiful, natural surrounding. Accomodations in twin shared room. Meals as indicated in the program itinerary(B-breakfast, L-lunch). All transfer as indicated in the program in air conditioned vehicle. 4 Islands tours by speedboat with based on join tour program with transfer, entrance fees, local guide, snorkeling gears. Koh Hong & Talaynai Tour by speedboat with based on join tour program with transfer, entrance fees, local guide, snorkeling gears. Round trip air ticket by TG promotional ticket.